One of the easiest ways to cook outside is on a grill over a fire pit. Plus you have the added bonus of getting to play with fire. It’s a tad more nuanced than fire plus raw chunks of food equals delicious dinners and there are definitely things you should know, but that’s the general gist of it. Additionally, it’s incredibly easy to adapt most stovetop and even some oven recipes for cooking on a grill. 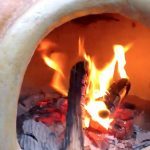 For cooking in a fire pit you can choose to burn wood, charcoal, or a mix of both if you want to play with smoky flavours with the ease of charcoal. 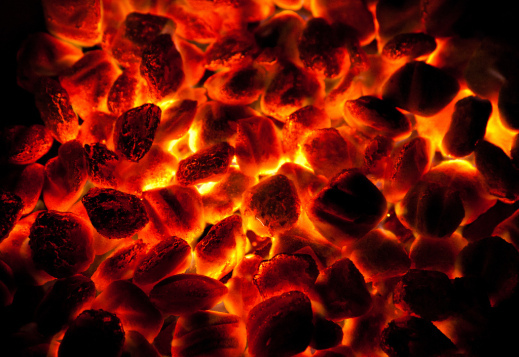 Charcoal has the benefits of being relatively easy to light and of burning fairly hot. It’s a great choice for beginners or for foods that have been marinated or pre-seasoned. Charcoal doesn’t give off strong smoky flavour to your food so it won’t overpower the flavours from the seasonings. 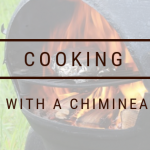 If you want to use charcoal for cooking but you want to sit around a cheerfully burning wood fire after, just throw some logs on the hot coal when you’re done with your food. 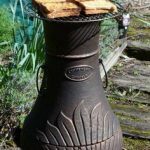 Wood is a more classic choice for a fire pit and remains fairly easy to light so long as you’re using the proper wood and know how to go about setting it up. The teepee or log cabin arrangements seem to be the most reliable methods. The trick here is to start with tinder, progress to kindling, and use the firewood. Your tinder can be comprised of small, quarter inch thick dry sticks, straw, pine needles, or bark. We recommend you stay away from using leaves and paper because these can quickly produce fly ash and risk a fire outside of your fire pit or cause burns. Kindling should be slightly bigger sticks or twigs. This would be the time to be lighting your charcoal if you’re using any. Follow up your kindling with decent sized logs. The best wood to use is a dry seasoned hardwood. 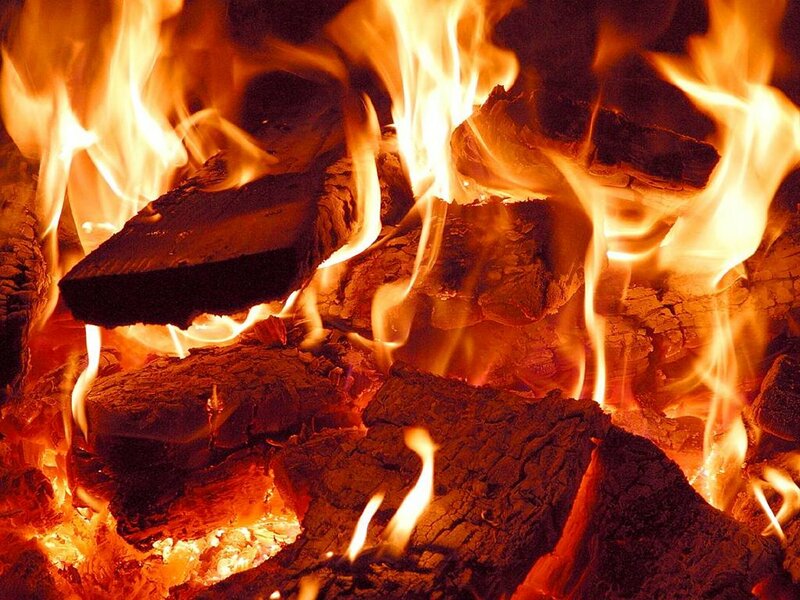 Hardwoods such as oak will burn hot and fairly cleanly. Avoid green and softwoods, as you’ll ruin your food. Green wood will sputter too much and softwoods, such as pine, will release an acrid toxic resin that will spoil the taste of your food. The location for your fire is very important for safety. Make sure the fire is not being set up under an overhang or overhanging foliage, it’s not on a flammable surface such as a deck, and if it’s in the ground it’s free of vegetation. Fire pits on the ground should preferably have a deep sandy base. 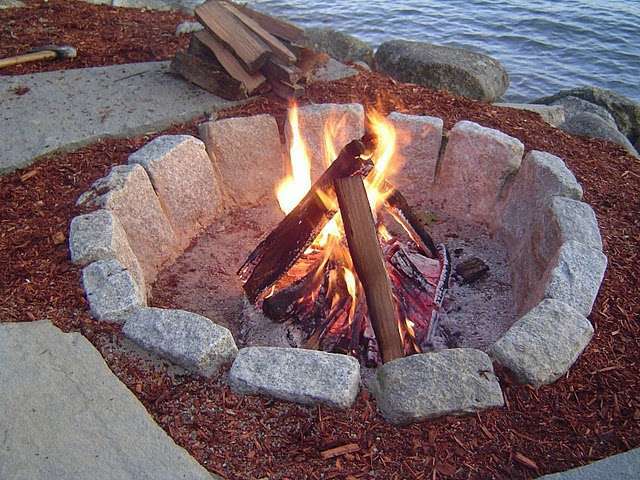 Fire pit rings, permanent or portable, are a good idea to provide shelter from a breeze but you should wait for another day if it’s windy. 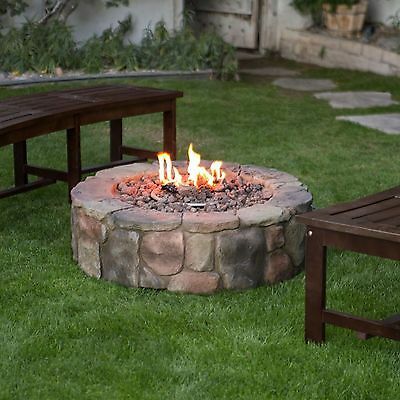 Once your fire pit is safely located you’ll need a fire pit grill. There are a wide variety of styles and sizes available but they’re basically just a cooking grill designed to stand over the fire. Some of them have adjustable heights and angles to make cooking over hot coals easier. Another type of grill hovers over your fire. You’ll also need some basic barbequing utensils such as a set of tongs, a spatula, and a grill brush. Make sure these tools have long handles so that you aren’t at risk of toasting your fingers as you flip your burgers. Digital and surface thermometers are great tools to have on hand especially if you’re a beginner. An instant read digital thermometer will let you know for sure that your meat is cooked properly and a surface thermometer can let you know how hot your grill is. 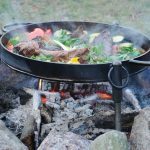 A lid is a great idea to have on hand for your fire pit grilling adventures because it will broaden the scope of what you can cook. With a lid to trap in the heat you can grill larger cuts of meat using indirect heat and you can also bake foods. 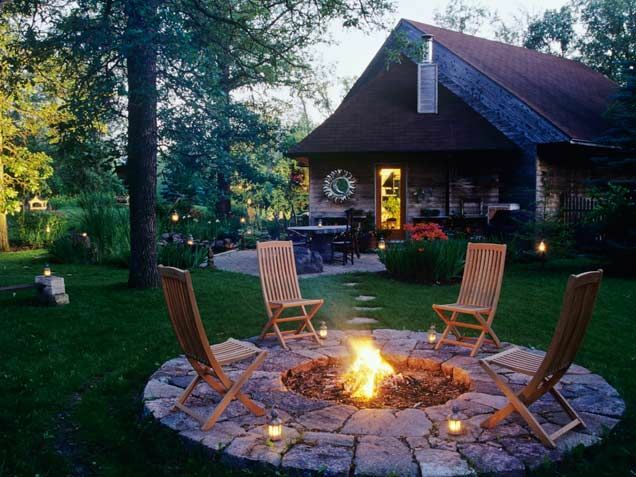 You’ll want to set up your fire pit so that you can avoid cooking directly over flames, cooking over too much heat, and cooking over too much smoke. The easiest way to achieve this is to create a two-zone system. On one side of the fire pit the fire will burn down logs to embers and on then the embers will be pushed to the other size where you can cook over and around them. This way your food won’t be charred by flames and if your embers start dying you can just add more from the fire. Managing the heat you cook over takes some practice but is easy to get the hang over. As a beginner it’s easiest to start by cooking smaller pieces of meat. Starting with pieces about one inch thick will let you easily learn how to control the smokiness of the food and learn how things cook over a grill. The two main ways to control how much heat your food is cooking over is how close the food is to the embers and how many embers there are. If the fire is too hot you can move embers away from the food to lower the heat or you can move the food away from the embers, closer to the edges of the grill. With some fire pit grills you can also raise the cooking surface or change the angle of the grill to achieve the same thing. If your food isn’t getting enough heat just do the opposite. 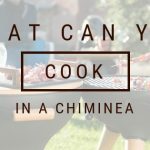 Move more hot embers under the food or move the food closer to the embers either by moving the food to a more central location on the grill or by moving the grill itself. Apply the same rules to achieve the desired smokiness. It’s a good idea to start cooking the thickest cut and slowest cooking pieces of food first so that everything is done around the same time. Remember that thicker cuts of meat will need to rest a bit and that they’ll continue to cook by another few degrees after they’ve been removed from the grill. This means you’ll want to take them off the grill just before they’re cooked to perfection or they’ll likely become overdone. A thermometer is an excellent tool to get the timing and temperatures down pat. Direct heat from cooking directly over the coals or embers is ideal for smaller cuts of meat and cuts that you may not want cooked all the way through such as steaks. Its excellent for achieving a great sear or for cooking small bits like kebabs. Hot dogs, hamburgers, and the like are perfect for cooking over direct heat. Larger cuts such as roasts will sear and char on the outside before the inside cooks. Indirect heat is ideal for larger cuts like roasts and whole chickens. For this method you’ll need a lid. Place the meat more around the embers than directly over top and place the lid over the fire pit. 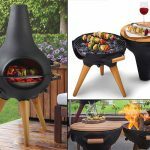 This will trap the heat and the convection of hot air and smoke will slowly cook your food through without burning the outside and leaving the inside raw. A surface thermometer is a good tool to help you keep an eye on the temperature under the lid. 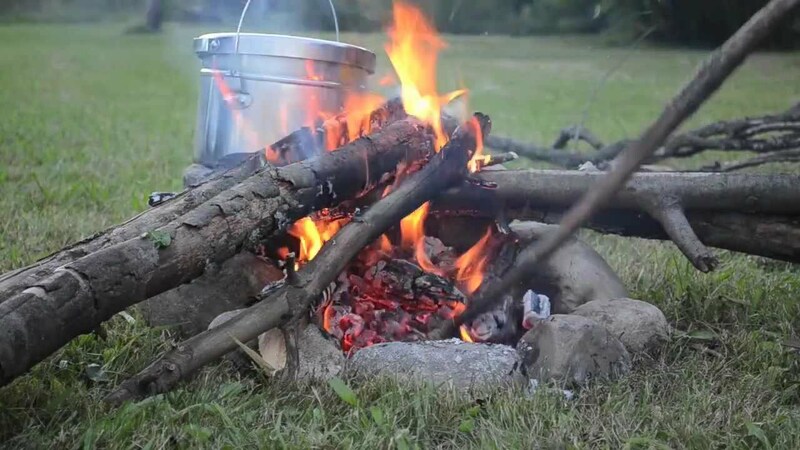 If needed, you can add more wood to the embers opposite your food to extend the cooking time.